Test your US trivia, from the tallest monument to the coldest state. Do you like to plan your travel based on extremes? From the highest peaks to the coldest yearly temperatures, the following USA sights are noteworthy of a visit from a statistical standpoint. While these attractions may very well have been on your radar all along, they do provide a new way to think about travel in the USA and can give you new ideas on where to go and what to see. Highest Point - Mount McKinley, also known as Denali, is located in Alaska. It rises to a height of more than 20,000 feet (6,194 meters). According to the CIA World Factbook for the United States, Mauna Kea, a volcano in Hawaii, would be classified as the world's tallest mountain (at 10,200 meters) if measured from its base on the Pacific Ocean floor. The tallest mountain in the lower 48 states is Mount Whitney in California. Lowest Point - Death Valley, in California, is the lowest point in the USA measuring in at 282 feet below sea level. Easternmost Point in the USA - The easternmost point in the Continental United States is West Quoddy Head, Maine. The easternmost point in the United States, including territories, is Point Udall on the island of St. Croix in the U.S. Virgin Islands. Westernmost Point in the USA - The westernmost point within the 50 states is Cape Wrangell, Alaska, located within the Wrangell-St. Elias and Glacier Bay National Park, part of a U.S. UNESCO site. Meanwhile, the westernmost point in the U.S. and territories is Point Udall, Guam. Northernmost Point in the USA - Point Barrow, Alaska, is the northernmost point of the U.S. Within the continental United States, the northernmost point is Lake of the Woods, Minnesota. Southernmost Point in the USA - Ka Lae, Hawaii, is the southernmost point in the 50 United States, while the southernmost of the 48 contiguous states is Cape Sable, Florida. The southernmost point of all U.S. territory is Rose Atoll in American Samoa. Tallest Building One World Trade Center, New York City. Also known as "Freedom Tower," the building at One World Trade Center is located on the site of the former World Trade Center buildings, which were destroyed on September 11, 2001. Prior to May 2013, Willis Tower (formerly Sears Tower) in Chicago, Illinois, was the tallest building in the USA. Tallest Monument - While One World Trade Center is a monument in some respects, the Gateway Arch, located in St. Louis, is the tallest monument in the United States. Largest City by Area - Yakutat, Alaska, is the largest city in the U.S. by area according to About's Geography guide. The largest city by area in the contiguous 48 states is Jacksonville, Florida. Largest City by Population - With more than eight million residents, New York City is the largest city in the United States by population, followed by Los Angeles, Chicago, Houston, and Phoenix. Largest Body of Water - Lake Superior, located on the northern borders of the states of Michigan, Wisconsin, and Minnesota, is the largest body of water in the United States and the largest freshwater lake in the world. Oldest City in the United States - This is a statistic that has many interpretations. 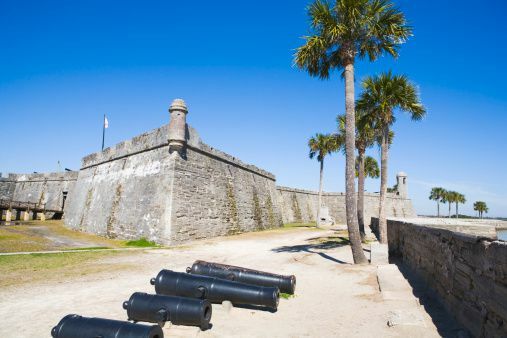 St. Augustine, Florida, founded in 1565, is the oldest continuously inhabited European established settlement in the United States. However, there are older native settlements in the USA. Cahokia, a Native American settlement located in present-day Illinois and one of the UNESCO World Heritage Sites located in the USA, was established in approximately 650. Acoma Pueblo and Taos Pueblo in New Mexico are the oldest continuously inhabited indigenous settlements in the United States, having been settled since 1000. The Oraibi Hopi Reservation in Arizona and the Zuni Pueblo Settlements were established in 1100 and 1450, respectively. San Juan, the capital of Puerto Rico (an incorporated territory of the United States) was founded by European settlers in 1521. Coldest Average Temperature - Barrow, Alaska, holds the record for coldest average temperature. In the lower 48, Mount Washington, New Hampshire, followed closely by International Falls, Minnesota, holds that distinction. Coldest Temperature Ever Recorded in the U.S. - Coldest recorded temperature in the U.S. was -80 degrees Fahrenheit at Prospect Creek Camp, Alaska. In the contiguous 48 states, the coldest was Rogers Pass, Montana, at -70 degrees Fahrenheit. Hottest Average Temperature - Phoenix, Arizona, holds the U.S. record for average days of year above 99 degrees Fahrenheit (approximately 37 degrees Celsius). Where Are the Wettest Places in the US?